Can Uber or Lyft drivers stop wherever they want? I know you have all been behind a car that you think is just a random car in Seattle only to find it abruptly stop and throw on its hazard lights. It is so frustrating to be behind what you think is a normal car only to find it stop in the middle of the road and you nearly get in a car accident because they are an Uber or Lyft driver dropping off or picking up a passenger. Is it legal for them to stop in the middle of the road wherever they want and nearly cause a car accident? It is actually illegal for Uber and Lyft drivers to put on their hazard lights and stop in the middle of the road to allow passengers in or out of their car. This requires a fine and is a moving violation not a parking violation. SMC 11.72.040 – Blocking or obstructing traffic—Occupied vehicle. How then can and should Uber and Lyft drivers let passengers in and out of their car? Uber and Lyft drivers should only let passengers out in designated load an unload areas in downtown Seattle. This is why these areas were created and why no one is allowed to park in these areas. Some will point to RCW 6.61.560(3) as creating an exception for Uber drivers to use their hazard lights to drop off and load passengers. However, this subsection only applies to public transport and non profit organizations that transport disabled people. This subsection does not create an exception for Uber and Lyft which are for profit organization who are not primarily transporting disabled people. RCW 6.61.560(3) Subsection (1) of this section does not apply to the driver of a public transit vehicle who temporarily stops the vehicle upon the roadway for the purpose of and while actually engaged in receiving or discharging passengers at a marked transit vehicle stop zone approved by the state department of transportation or a county upon highways under their respective jurisdictions. However, public transportation service providers, including private, nonprofit transportation providers regulated under chapter 81.66 RCW, may allow the driver of a transit vehicle to stop upon the roadway momentarily to receive or discharge passengers at an unmarked stop zone only under the following circumstances: (a) The driver stops the vehicle in a safe and practicable position; (b) the driver activates four-way flashing lights; and (c) the driver stops at a portion of the highway with an unobstructed view, for an adequate distance so as to not create a hazard, for other drivers. If you have ever been in an Uber or Lyft, you know that the Uber or Lyft driver relies heavily on navigational equipment in their car to get you from point A and point B. 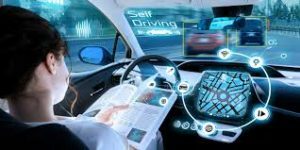 This reliance on the navigational equipment to get you to a point the driver has probably never been before can create a hazard to other drivers as the driver constantly looks at their navigation app and could cause a Seattle car accident. There is a high degree of attention that must be paid to the road when navigating Seattle streets due to the many one way streets, heavy traffic, hills, and fast drivers. If an Uber or Lyft driver is looking at their navigation device while driving in an unknown area with heavy traffic, they may get into a car accident because of their distracted driving that may cause injury to their passenger or other cars around them. If you are in a car accident and are injured by the result of the negligence of an Uber or Lyft driver in Seattle who was distracted, there are many confusing insurance scenarios on who is responsible for the car accident. Uber and Lyft have certain legal requirements and varying insurance coverage depending on whether they are picking up a passenger, looking for a passenger, or off work. The insurance coverage required for each situation varies largely with each scenario. If an Uber or Lyft driver has a passenger and is driving them to a destination, Seattle and Washington law requires Uber and Lyft to cover any liability charged to their driver as a result of their negligence that causes a car accident injury to their passengers or people in other cars. This is the time where Uber and Lyft will have their most insurance coverage for you. They are required to have $1,000,000 in insurance coverage. However, if you are injured by an Uber driver who is searching for a passenger, the insurance coverage available to you may be far less. This insurance coverage may not be enough to cover any injury requiring a hospital visit and extensive physical therapy or chiropractic treatment, let alone a surgery. Additionally, if you are injured by an Uber driver who is not actively searching for a passenger, their own insurance will cover your injuries. These Uber or Lyft drivers may only have the minimum insurance policy of $25,000 required for liability in Seattle and Washington State. If you are injured in an accident with minimum coverage, this amount may be exhausted with a hospital visit and extensive physical therapy of chiropractic treatment. 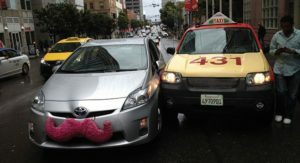 Moreover, if an Uber or Lyft driver does not have their ridesharing app on showing that they have a passenger or are looking for a passenger when the car accident happens, Uber and Lyft may claim no responsibility for the car accident and say that the driver must use their own insurance and they claim no responsibility for their driver even if their driver did in fact have a passenger or was actively searching for one. This comes into play even more so if there are no witnesses to prove otherwise. For these reasons, it is a good idea to get a Seattle personal injury lawyer immediately following a car accident injury with an Uber or Lyft driver. Call today for a free consultation. Seattle personal injury lawyers are paid out of the settlement so their is never any out of pocket costs to you. This way everyone can afford a Seattle personal injury lawyer but you cannot afford not to have one. What if you are in an Uber or Lyft car that is hit by another car? Many people have wondered who is going to pay for their car accident injuries immediately following the car accident. Can you go to the emergency room and not have to pay out of pocket? Can you go see a chiropractor and not pay out of pocket? Who is going to pay for your medical bills right now? The defendant’s insurance, if you are hit by another car while riding in a Lyft or Uber, will not pay for your medical bills immediately. This is because they will only make one settlement payment to you that will encompass compensation in full for medical bills, lost wages, and pain and suffering, among others. In order to maximize your recovery, you should wait until you no longer require any further medical treatment to settle your case with the defendant’s car insurance. They will not pay your right away for medical bills so don’t expect them to, even though they will in the end (there is an exception if you are a passenger of an at fault vehicle, a pedestrian, or a bicyclist hit by a car). What to do to pay for your medical bills after a Lyft or Uber accident? 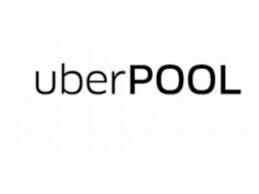 Contact Uber or Lyft and get your claim number and PIP application from them. Washington State now requires Uber and Lyft to carry PIP insurance for their passengers. 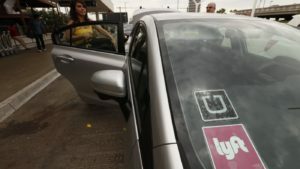 Senate Bill 5550 in 2015 was passed and now amends the law on required automobile insurance to apply to ride sharing services like Uber and Lyft. Now Uber and Lyft must provide at a minimum $10,000 in PIP benefits to their passengers if there is a car accident involving their drivers no matter if it was their driver’s fault or not. If you have been injured in a car accident while riding in an Uber or a Lyft car, you are entitled to PIP from Uber or Lyft today! Don’t let them fool you into thinking they are not required to cover your medical bills and the other driver at fault is required to pay for your medical bills. If you have been injured in a Seattle Uber or Lyft car accident, contact me today for a free consultation. Lyft Car Accident In Seattle: What to do? If you are injured in a car accident with a Lyft driver or while riding in a Lyft car in Seattle, there are a lot of possible insurance companies at fault for your injury case. You could have the benefit of many possible insurance companies to recover money from to pay for your injury treatment and pain and suffering. If you are hit by a Lyft driver, you have three avenues to recover: Lyft insurance, the at fault driver’s insurance, or your own insurance. If the Lyft driver is actively looking for a passenger to money or has a Lyft passenger, Lyft’s insurance coverage will cover the car accident. If you are hit by a lyft driver who is not actively searching for a Lyft customer or has a Lyft customer, the Lyft driver’s personal insurance coverage will be responsible for your car accident injury case. If you are hit by a Lyft driver that doesn’t have insurance for whatever reason and Lyft’s insurance doesn’t apply because there was no passenger or active search for a passenger, your own insurance will cover your car accident injury case if you have UIM insurance (uninsured motorist insurance). This insurance coverage will step in and pay for your medical bills, lost wages, and pain and suffering as if they were representing the defendant. You need a lawyer for this case. If you are a passenger in a Lyft car accident, you have possible avenues to recover from such as Lyft or the other driver that hit your Lyft driver. If you have your own insurance coverage for UIM and PIP, it will step in and cover your medical bills and personal injuries that Lyft did not have enough coverage to compensate you for. If you have any questions, call Andrew Cherin today at 2068506716 or email me at andrew@lawcherin.com.